I went to an Indian restaurant with some friends the other night and we took notice of these beautiful chandeliers hanging from the ceiling. It appeared to be made with black lace and fringe (sounds scary but it was quite elegant). 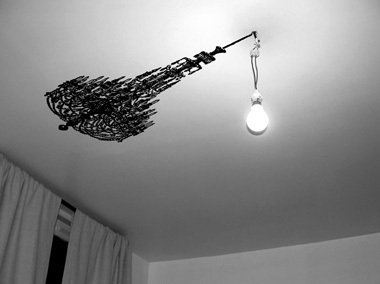 That got me thinking, there must be some really weird chandeliers out there, typed it in Google and voila!10 Crazy Chandeliers Made From Recycled Materials. They showcase light fixtures made from cutlery, beer bottles, pens, even tampons (don’t worry they’re unused). Here’s another post from four walls and a roof on Quirky Chandeliers. Looking for something even more interesting and elegant? The Flame Pendant Lamp designed by Bathsheba Grossman is exactly that, radiating strips of light that gives your room an intimate feel. What’s interesting is that it is made using rapid prototyping (RP) technology. Each lamp created with Materialise Software is given its own unique file and put on a cd for the buyer. The buyer can then re-order more Flames whenever they like. This item is found on PlushPod of which I encourage you to view their Chandelier Collection. How about owning a fancy chandelier without the fancy price tag? This chandelier applique called Chandelier Autocollants by Munchausen gives the illusion of an ornate light fixture, dressing up your simple light bulb. Just peel and stick onto your ceiling. It may not be the real deal, but at the very least it will probably confuse your guests for a moment. Very nice design valuable information thank you. Bubble Chandelier – Light Fixtures – Swarovski – Modern Lighting – Custom made Chandeliers Premiere Luminaire Montreal.